Computer Knowledge: The candidate should have computer knowledge and will be required to furnish basic computer training certificate for at least 60 days from a recognized Computer Training Institute. This requirement of basic computer knowledge certificate shall be relaxable in cases where a candidate has studied computer as a subject in Class X or Class XII or higher educational qualification. Selection Process: Selection will be made as per the automatic generated merit list as per the rules based on the candidates online submitted applications. No weightage will be given for higher educational qualification. Only marks obtained in 10th standard of approved Boards aggregated to percentage to the accuracy of 4 decimals will be the criteria for finalizing the selection. How to apply: Candidate who desires to apply online for Odisha Postal Circle Gramin Dak Sevak Recruitment 2017 will have to register himself in the portal through www.indiapost.gov.in or www.appost.in/gdsonline from 21.11.2017 to 20.12.2017 with the basic details to obtain the Registration Number. 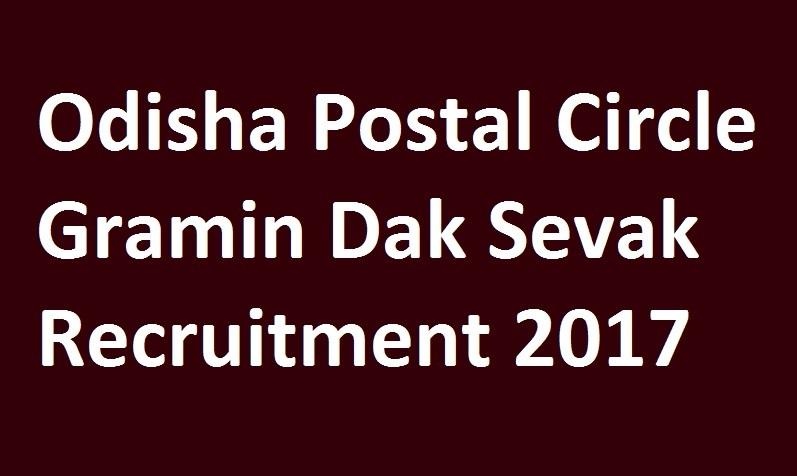 For more details about Odisha Postal Circle Gramin Dak Sevak Recruitment 2017 refer to detailed notification. 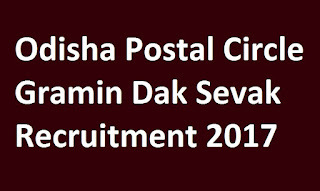 Odisha Gramin Dak Sevak Recruitment 2017 - India Posts Recruitment – Odisha Postal Circle Recruitment – Odisha Postal Circle invites online applications from eligible candidates for the recruitment of 1072 Gramin Dak Sevak GDS posts. Interested candidates can apply online from 27.03.2017 to 26.04.2017. How to apply: Candidate who desires to apply online for Odisha Postal Circle Gramin Dak Sevak Recruitment 2017 will have to register himself in the portal through www.indiapost.gov.in or www.appost.in/gdsonline from 27.03.2017 to 26.04.2017 with the basic details to obtain the Registration Number.